Exploring the secrets of the world is not a task for an ordinary cruise, nor is it entrusted to just any guest. Be the first to embark on Silversea’s inaugural Expedition World Cruise, “The Uncharted World Tour”, and discover the untouched wonders of the world. Adventure 167 days with no time for boredom, as you see the world raw and unfiltered for the first time. From Ushuaia to Tromsø, the 167-day voyage will call at 107 of the planet’s most amazing destinations, in 30 must-visit countries—including six new ports of call for Silversea (Naxos, Folegandros, Nafpaktos, Ksamil, Bejaïa, and Fort William). Take exploration to new levels on the first ever Expedition World Cruise. Book soon for the best pricing and early booking bonuses! Departing Ushuaia on January 30, 2021, Silversea’s ultra-luxurious ice-class crossover, Silver Cloud, will journey between Antarctica’s highlight destinations, before setting course for Chile’s Valparaiso via the Chilean Fjords. Subsequently, guests will set sail for Papeete, Tahiti, via Easter Island and the fabled Pitcairn Island, before voyaging towards Lautoka, Fiji. Calls in a number of other iconic destinations in Oceania including remote exploration stops in Vanuatu, the Solomon Islands and Papua New Guinea precede guests’ arrival in Cairns, Australia, which then leads to the Kimberley Coast. Guests will subsequently unlock various destinations in Indonesia, before arriving in Singapore. Next, Silver Cloud will set sail for Sumatra, Sri Lanka and Cochin, India, prior to reaching Piraeus (Athens), Lisbon, and Reykjavik. 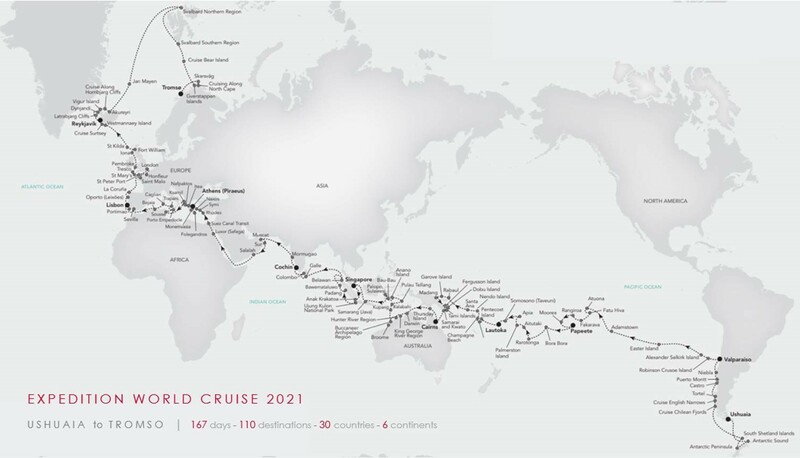 Part of an emphatic conclusion, guests aboard Silversea’s 2021 Expedition World Cruise will then explore the highlights of Iceland, ahead of calls in the Svalbard Region and the voyage’s conclusion in Tromsø, Norway, on July 16, 2021. With 18-brand new Zodiacs, four superlative restaurants in Antarctica and a pole to pole expedition itinerary, Silver Cloud really does break the ice between expedition and luxury. After extensive refurbishment, Silver Cloud is the most spacious and comfortable ice class vessel in expedition cruising. Her large suites, her destination itineraries and her unparalleled service make her truly special. Her four dining options will tantalize your taste buds and as 80% of her suites include a veranda, watching a breaching whale or a few cavorting penguins has never been so personal. A limited number of guests in polar waters, mean that Silver Cloud has the highest space to guest and crew to guest ratios in expedition cruising. With her 18 zodiacs, 10 kayaks, possibilities are almost limitless with ship-wide simultaneous explorations. Aboard Silversea ships, guests enjoy ocean-view suites, sumptuous cuisine, and the personalized service of a butler. Enriching the experience are such all-inclusive amenities as complimentary premium wines and spirits, specialty coffees, bottled water, juices and soft drinks served throughout the ship; an in-suite bar, stocked with guests’ preferences; in-suite 24-hour dining; and unlimited complimentary Wi-Fi. Throughout both World Cruises in 2021, guests will also benefit from a complimentary laundry service; medical service; and an inclusive visa package for nationals of the USA, Canada, UK, Germany and Australia.